Swallowtail flies again. This time with a background of Blooming with Kindness in Melon Mambo. This colour is becoming one of my favourites. 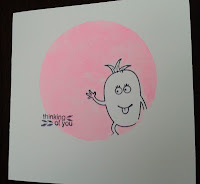 I bought this stamp set because I thought the sentiments were so good and I like the flower! 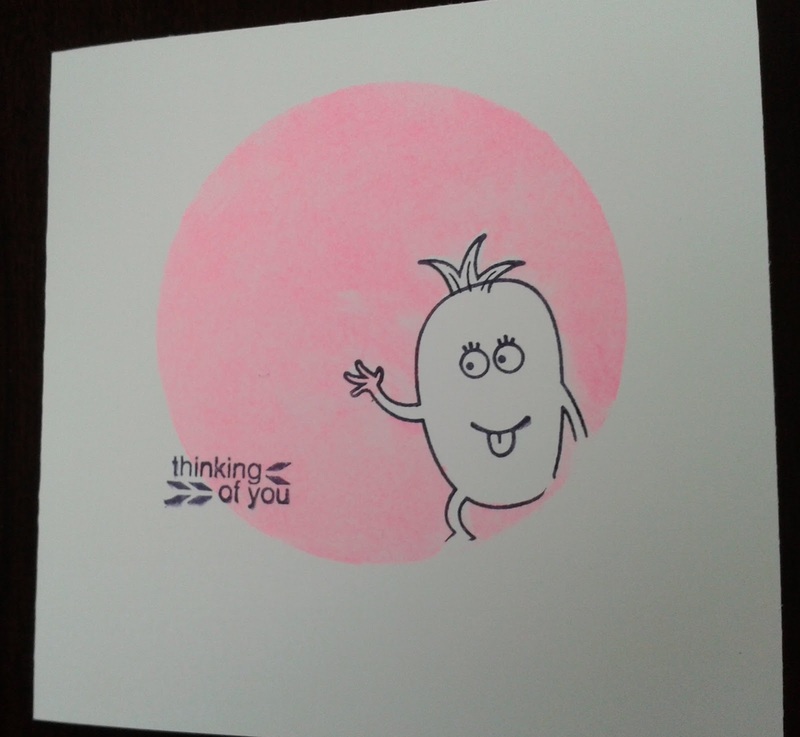 The sentiment here is apt for the purpose of the card, we all hope for the best for Julie. 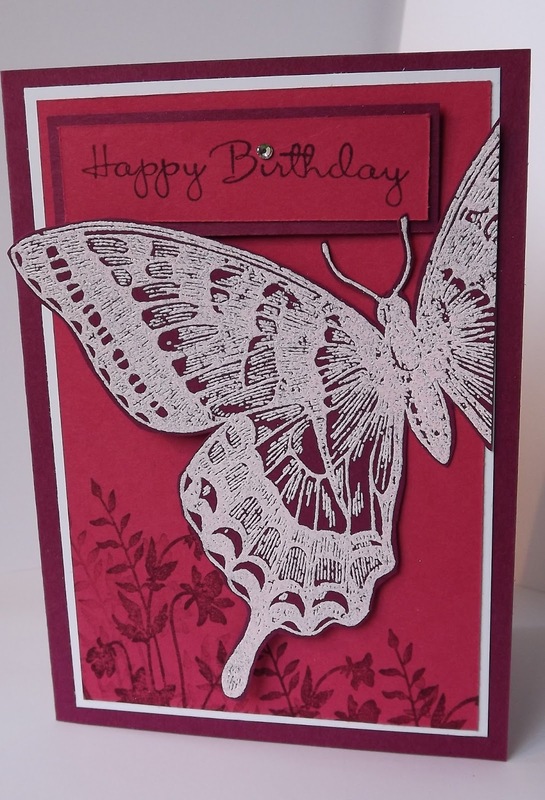 The swallowtail is stamped with Whisper White on Chocolate Chip card. 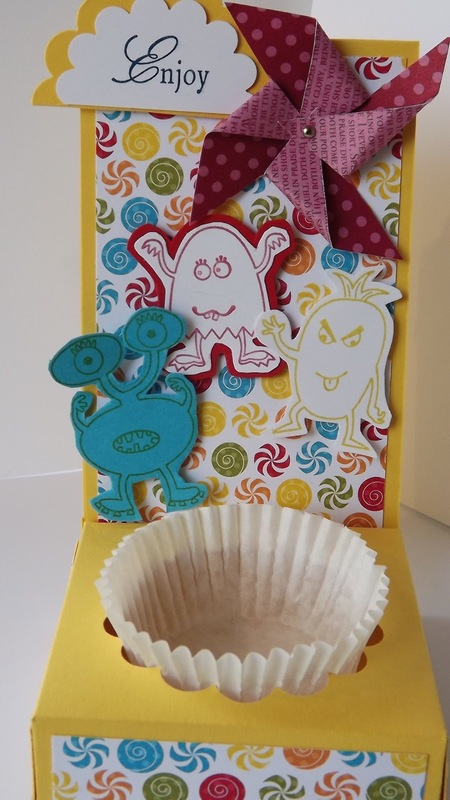 Last week was hectic and this week I haven't settled to crafting due to being snowed in since Friday. Creative mojo frozen. Have just heard that the plough is making a start on the bottom of the road so may be back with wheels tomorrow. Whooppee! I love this By the Tide set it reminds me of when I was young, growing up be the sea. I also love making little books so here I have combined the two. This is stamped with the fish and the sea weed. 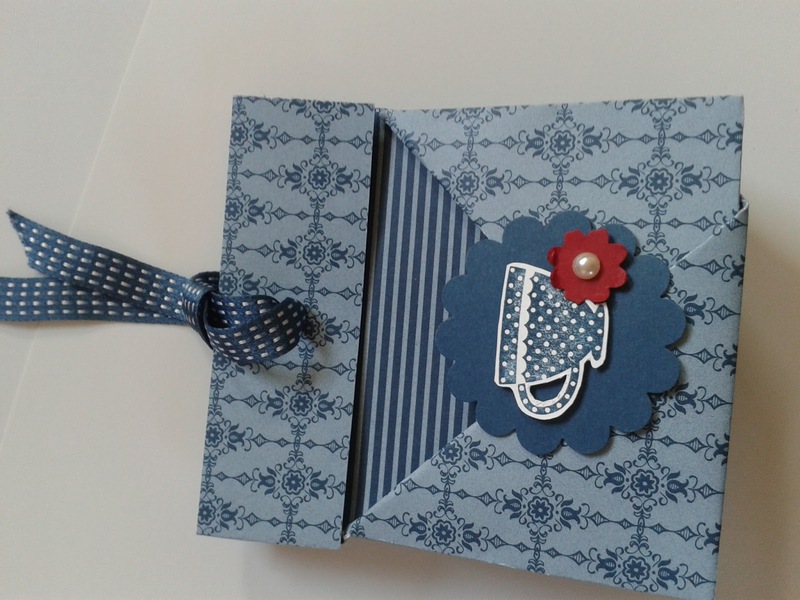 I have used small pieces of paper out of my offcuts box and the eye of the owl punch to embellish the page. 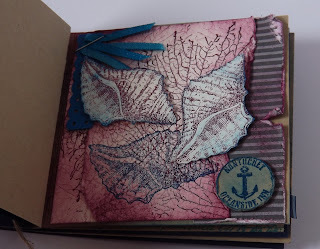 This page is with the shell form the stamp set I've used Rich Rassleberry with Not quite Navy. This colour combo looks really good. A bit of tearing to layer the papers. 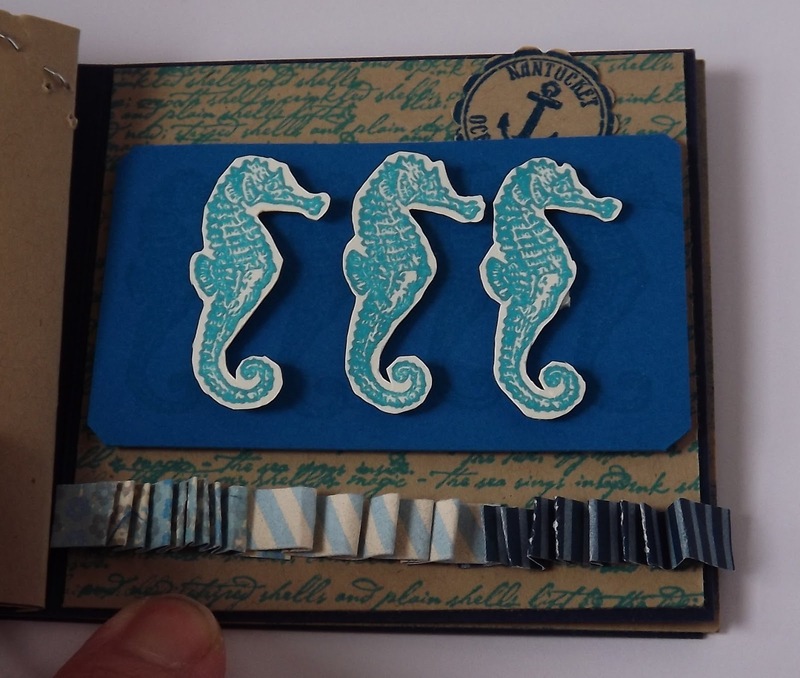 This is a much simpler page using the sea horse. I have had a go a making the paper ribbon but the folds aren't even enough but look in keeping with the book. Again this page is made from bits in the bits box. And finally the lobster! I was pleased with the background using sequin scrap daubed in blue and Rich Rassleberry for the sea weed. 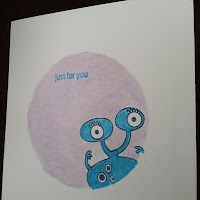 The lobster I have inked in White, the first stamping onto crumb cake the second onto the blue this ink is so lush. 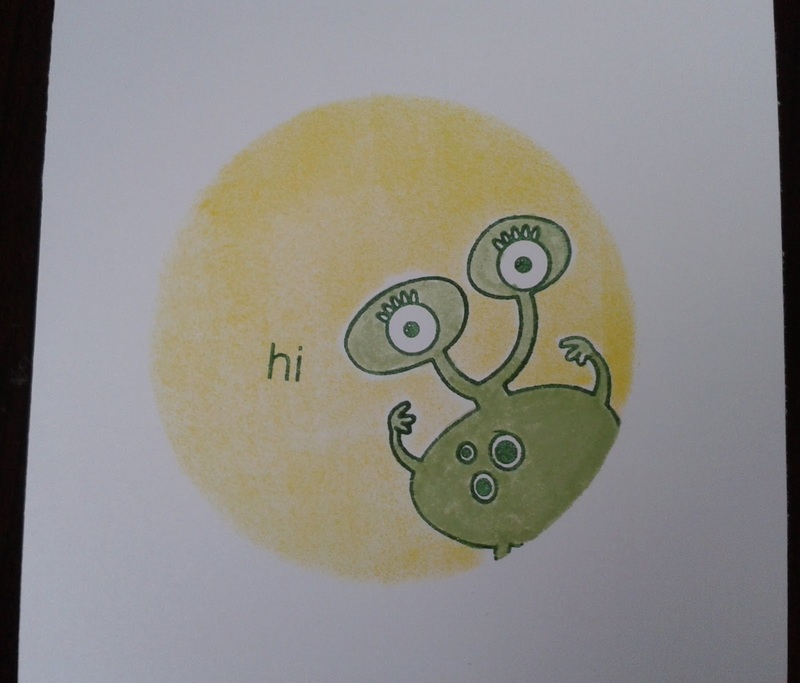 I have then pulled the ink with a water brush. I have cut around his 'feelers' but torn around his body. Not quite so happy with this page but not sure why. 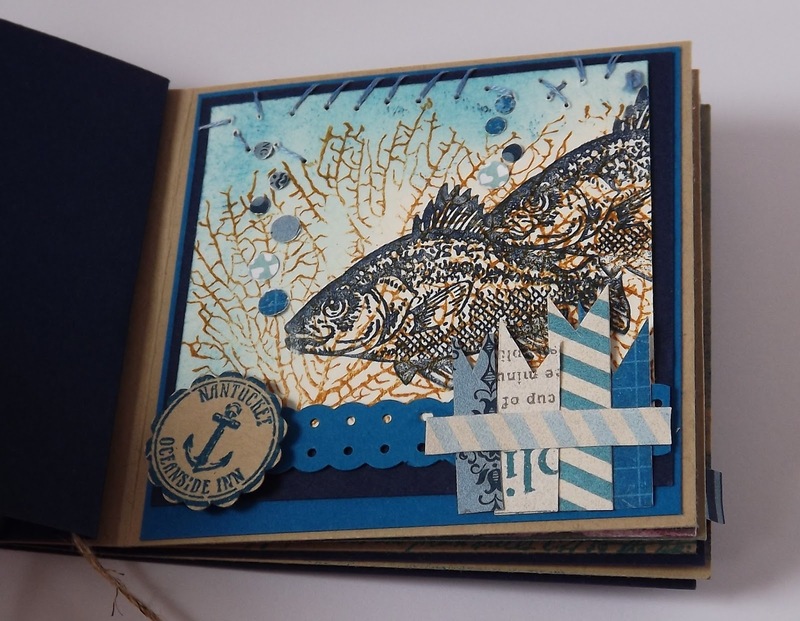 Overall I still love making little books and think this set is ideal for them. P.S. The snow plough still hasn't reached us! The first outing of this set and again loads of low-tac paper. This is going to become one of my favorite sets I have had a go with the lobster to make him articulated..... my other half just laughed but I will perfect it. The fish are so easy to colour, rainbow fish are on their way. 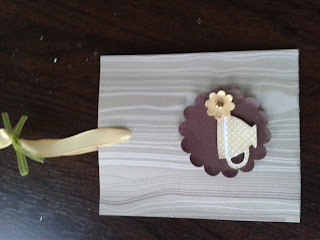 I have used the new scoring board to put a wavy pattern in the background, a small greeting and narrow ribbon to finish. I said this would be a well used stamp! I made this for my friend Chris. 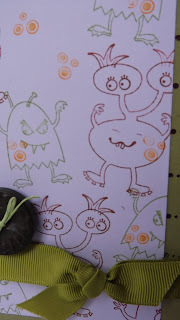 She was my Stampin' Up Mummy. She is a very good friend which makes me very lucky. 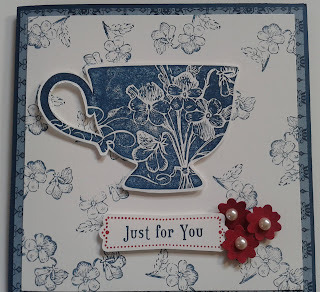 Chris has lovely design ideas and a great eye for colour combinations. Her vintage style makes are just wonderful. 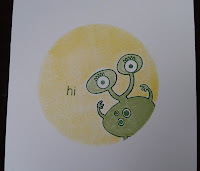 On the day I made this I opened my white ink pad, wow was it juicy. This butterfly is the stamped off one. 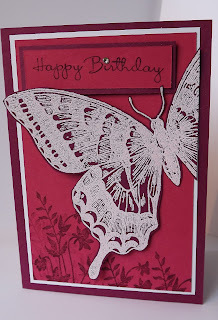 The first stamping was brilliant white! 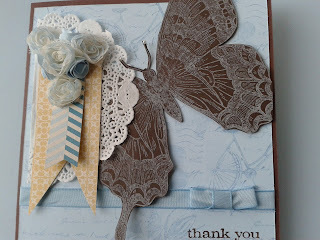 Using this on the chocolate chip card has given it a blue tinge so I have used the bashful blue card and ribbon. The DSP is from the tea for two, another firm favorite. 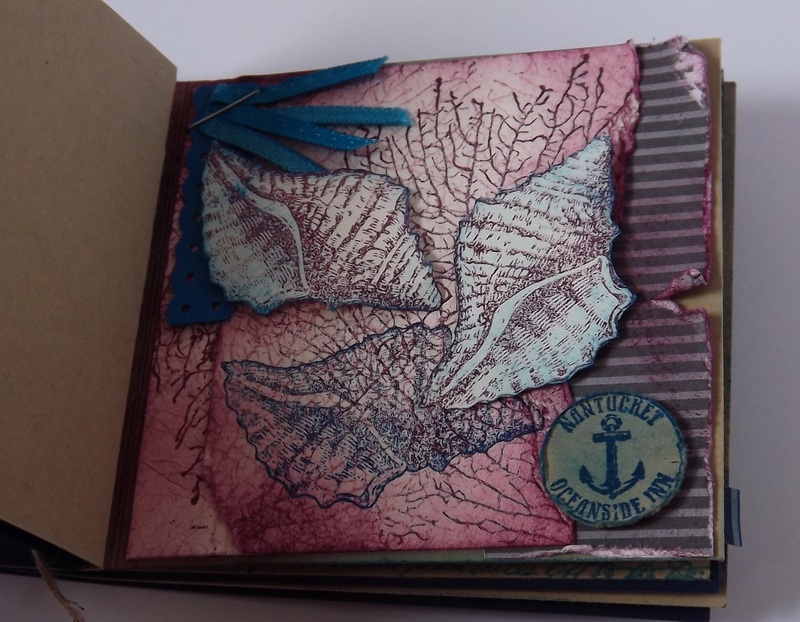 I have used one of my other favorite stamp sets for the background, can you tell what it is? The cold and flu bug has hit our household again and I have been playing at Nurse Gladys! Slipped away today to try something very new to me, 'one layer cards'. After some research through my stack of magazines and some time browsing the net I set to. This is what I came up with. There are a number in the bin too! I should be able to get these in one line, and they started out as the same size! Although they look simple they do take a lot of time and care to do. I used quite a lot of post it notes untill I found my roll of low-tak paper. 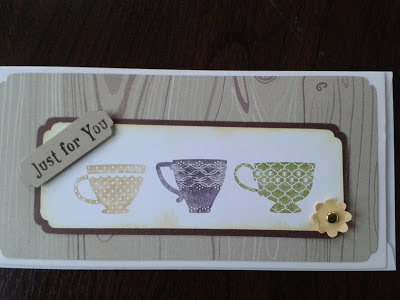 The sentiment stamps are part of the Stampin Up bundle with the Boutique Boxes. 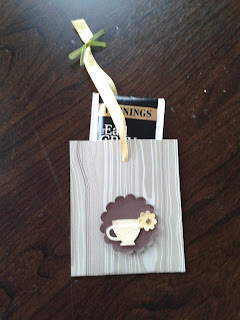 One of our quicker makes on 'shoe box day' was a tea bag gift holder. 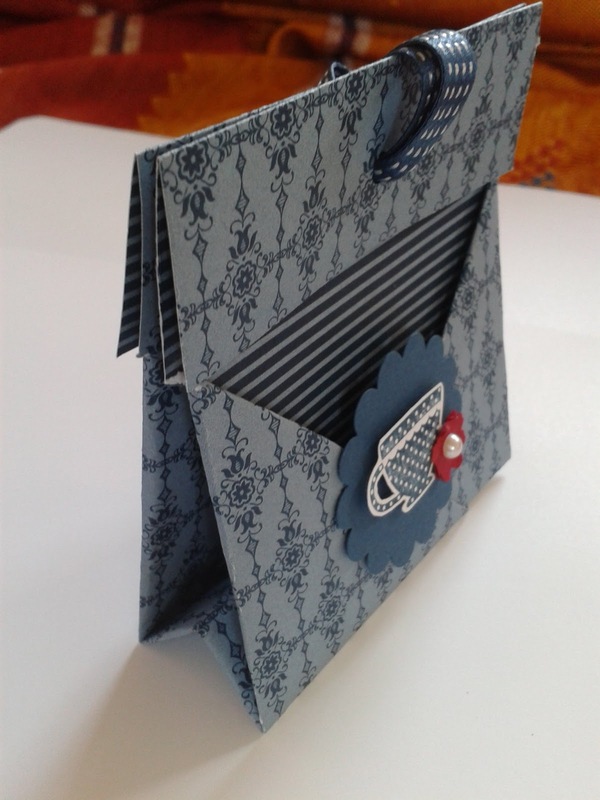 So with the tea shoppe set in hand I made a different matching card and bag. As I haven't got the wood grain stamp I have used up some DSP from last year, quite effective I think! As you pull the ribbon up the tea bag comes out! Nifty! I still haven't been able to buy any viscount biscuits so not sure if they would fit in this. Anybody know any other flat round chocolate biscuits that are individually wrapped? Of course this could be blinged up loads more but I quite like the simplicity myself. Its here again. 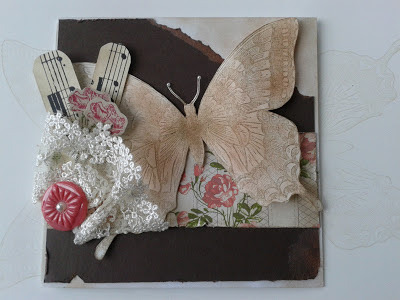 Today is vintage day in the craft room. I have opened my artisan embellishments kit from the spring catalogue. Lovely items. Really like the buttons. I have also opened my pack of Tea for Two paper that has been on the shelf for nearly 3 weeks. I can see me using this quickly. Both sides of all the papers are really pretty. So this is my first attempt at vintage! I have torn and daubed in two colours. Card: Chocolate chip, soft suade. Music paper and flowers from discontinued paper and stamps. Got to use what you have got! Sorry its been nearly a week. Not sure where the time went!. We had a lovely afternoon in Midgley using the Tea Shoppe stamp set. We made a card and a small gift bag into which you could put a tea bag and a viscount biscuit. Unfortunately after visiting 3 supermarkets I was unable to get the biscuits! Midnight Muse was the main colour. The little red flowers lift the design, all were very pleased with the results. Next months theme is 'In the garden'. It will be flowers all the way. Monday 15th April 1-3. £6 Get in touch to book your place early. One from long ago. I bought this SU stamp a while ago from an 'internet site....' I just love chickens. The ones that strut around here are so soft and fluffy. The cardboard and string are recycled items. As the monster set was still on my desk from unpacking my bag at the end of Saturday Shoe Box day I thought I would do another card of monsters. Chocolate Chip and Old Olive card and ink. The ribbon and button are out of my old stash. Spring has sprung. After freezing fog this morning the sun has finally come out and the first lambs have arrived in the field next to our house. The Swallowtail has fluttered again, this time all in pink. 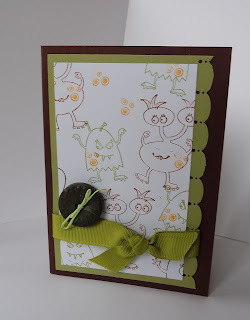 I've used the Just believe as a background stamped in Cherry Cobbler onto Melon Mambo. 1 rhinestone to dot the 'i' in birthday. Here it is..... My. Cupcake Holder. If I had had this when my boys were young I could have done away with those terrible 'party bags' which I hated, cheap sweets and useless toys.! 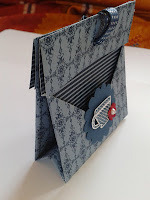 I cased this from www.frenchiestamps.com a site which I visit regularly. 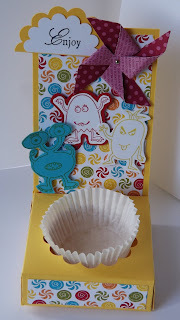 I have used my monster set as I think it is such fun. Just imagine this with a cupcake or butterfly buns in. Mine will be filled when each person has completed it. 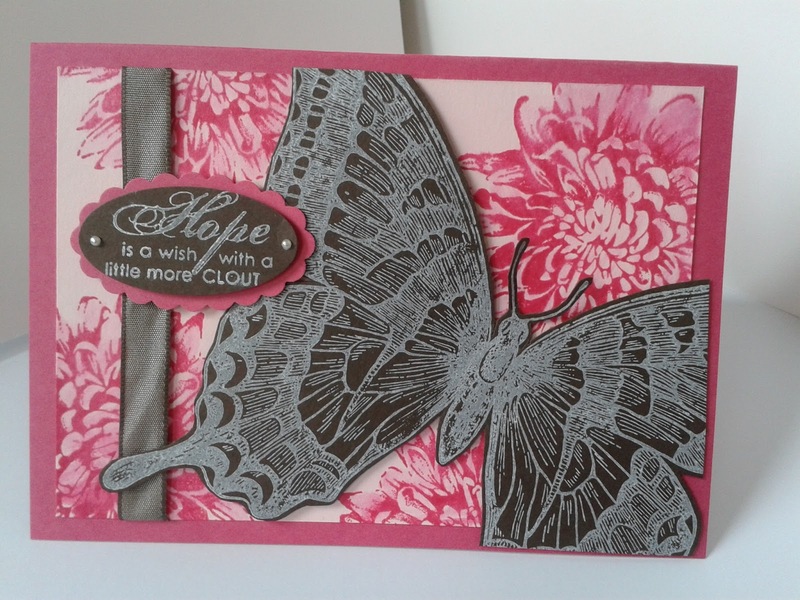 The details, I have used DSP from last seasons big top, it has windmills on the background which are very much in fashion and in the spring catalogue at the moment. My windmill is made from In Colour paper pack. 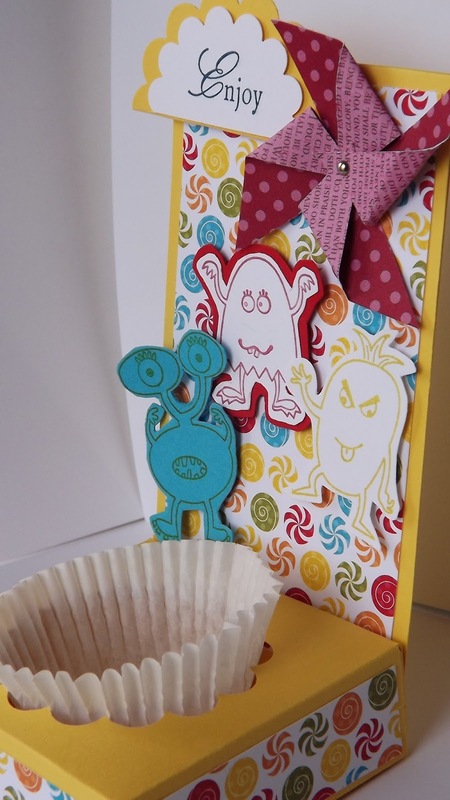 The cloud is from the punch out of the cupcake holder as well as a 1 3/4 " punch from whisper white. The monsters I have stamped on whisper white, one of which is mounted on coloured card and the third one is stamped onto card. This just gives variety. I really enjoyed making this and I will enjoy eating my butterfly bun!